QuiteRSS news reader now is at version 0.17.0. The new release allows to browse feeds in newspaper layout. QuiteRSS is a free and open source RSS/Atom feed reader available for Windows, Mac OS X, and Linux. It aims to be quite fast and comfortable to user, and features embedded browser (Webkit core), Unity indicator, adblock, click to flash, and more. According to the release note, since QuiteRSS 0.17.0 it allows to switch between the classic and newspaper layout mode through menu View -> Layout. It has been found that the newspaper mode has an issue on news deletion. The developer commented that it will be fixed in next release. The latest release has been made into the official PPA repository, available for Ubuntu 14.04, Ubuntu 12.04 and derivatives. After added the PPA, you can receive future updates by running regular system updates via Software Updater. Don’t want to add PPA? Grab the .deb directly from the Launchpad Page and install it via Software Center. QuiteRSS RSS/Atom news feeds reader got an update recently with a few improvements and bug fixes. Now it allows you to share news to LinkedIn, Blogger, Printer Friendly. QuiteRSS is an open-source cross-platform RSS/Atom news feeds reader which aims to be quite fast and comfortable to user. It features embedded browser (Webkit core), feed and news filters, adblock, click to flash, import/export feeds (OPML-files), and more. So now the reader allows users to share news to Evernote, Google+, Facebook, Twitter, LiveJournal, Pocket, VK, LinkedIn, Blogger, Printer Friendly, or via Email. 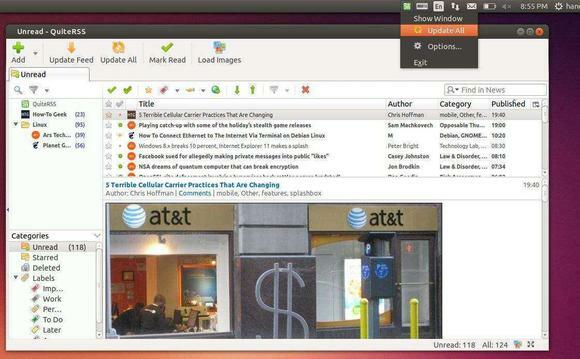 The official Ubuntu PPA provides the latest builds for Ubuntu 14.04, Ubuntu 13.10, Ubuntu 12.04 and their derivatives. If you have already added the QuiteRSS PPA, you can receive updates via Software Updater by running regular Ubuntu updates. 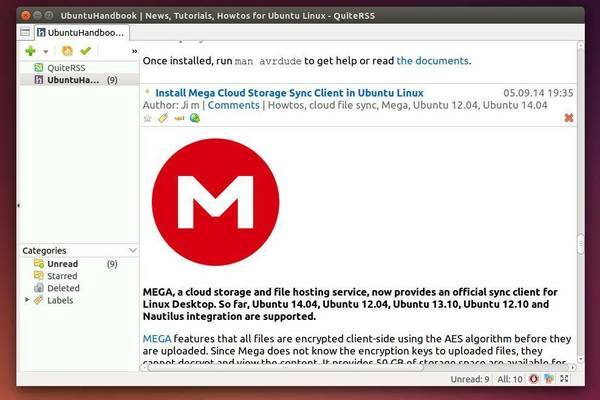 QuiteRSS is an open-source RSS/Atom feed reader aims to be quite fast and comfortable to user. It’s written in Qt/С++, available for Linux, Windows, OS X, OS/2. The new release will be available in the maintainer’s PPA for Ubuntu 14.04, Ubuntu 13.10, and Ubuntu 12.04. QuiteRSS, an open-source cross-platform RSS/Atom news feeds reader has released version 0.15.1 with integrated Adblock , other new features and bug fixes. This simple and brief tutorial is going to show you how to install or upgrade the most recent QuiteRSS 0.15.1 in Ubuntu 13.10, Ubuntu 12.04 and Ubuntu 12.10 via PPA. Press Ctrl+Alt+T on your keyboard to open a terminal window. When it opens, paste the command below and hit Enter to add the official PPA (Personal Package Archive) to your system and type in your password when prompt. QuiteRSS is an open-source RSS/Atom news feeds reader available for Windows, Linux, FreeBSD, OS/2. It’s written in Qt/С++, aims to be quite fast and comfortable. For Ubuntu 13.10, Ubuntu 13.04, Ubuntu 12.10, Ubuntu 12.04, Linux Mint and their derivatives, we can easily install QuiteRSS from PPA. 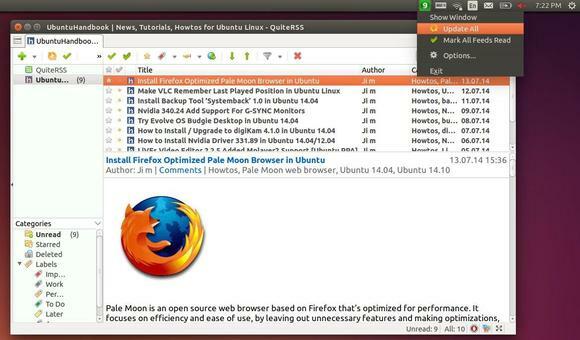 For Ubuntu 14.04 Trusty LTS, you can search & install this app in Ubuntu Software Center.